The main objective of the reading comprehension worksheets featured here is to train fourth-grade children to refer to details while they draw inferences, describe characters and settings in depth, focus on words and phrases including allusions, understand the structural elements of poems such as meter and verse, know syllabication and letter-sound correspondence and read with sufficient accuracy and fluency. Baseball is one of the most widely played games in the country. 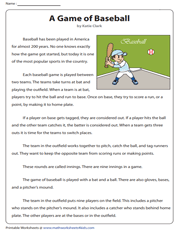 With this grade 4 worksheet PDF, children learn domain-specific words and enrich their vocabulary with baseball terms and phrases and complete a paragraph. Comprehend the value of rules in life and figure out what makes Jessie agree with Mrs. Williamson. Test comprehension with the follow-up exercises like adding the suffix -er to make verbs, analyze Jessie's character too. 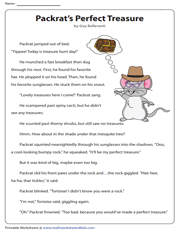 Learn how Packrat finds three friends in his pursuit for treasure with this interesting story. 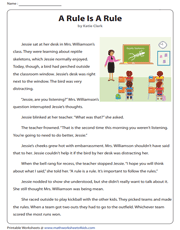 The printable passage reading gives an insight into finding the moral of the story and drawing inferences, both central to the Common Core Standards. 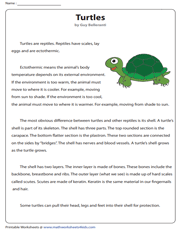 This article sheds light on how turtles differ from other reptiles. 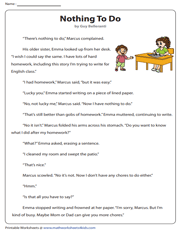 4th-grade children sharpen their reading skills in this worksheet packed with an amazing set of questions on key details and hone vocabulary with some domain-specific words. 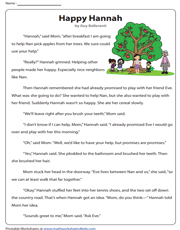 "Happy Hannah" drives home that helpful friends make the world a better place to live in. This story comprehension introduces palindromes and comes with a few expressions kids can use in daily life. Explore Ooloo's bath and how it creates a stir in the neighborhood. 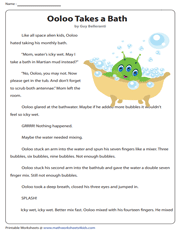 This ELA worksheet prepares children to find the central message and nurtures their flair for retelling part of the story and reflecting on what is read. Nature has countless faces like quiet, heat or rain. 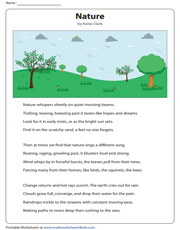 This refreshing grade 4 poems celebrate the accommodating face of Nature and hone the kids' ability to closely study the poem and make a list of domain-specific words. Have you ever had a happy nightmare? Find out what a happy nightmare is with this piece of fiction. The worksheet prepared in compliance with CCSS grade 4 ELA has questions based on deductions and inferences from the passages. Marcus is bored as he has nothing to do. 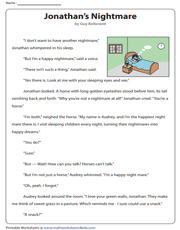 This literature worksheet has a lot in store for grade 4 children. It has a new prefix and reinforces kids' expertise with finding key details and character sketch. 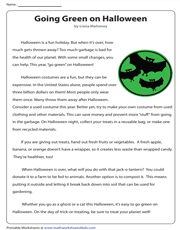 Americans splurge on Halloween celebrations and add to the country's garbage which the author dislikes. Here children attempt to support arguments with reasons or evidence and find the central message. Putting up the Christmas Tree is great fun. 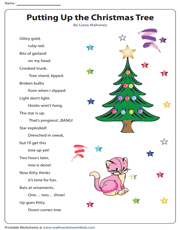 In this cute grade 4 poems, your child learns some vocabulary and bolsters their practice in alliteration and rhyming, two very important literary devices.